After you have cloned the repository, you will be on the master branch. Do not make changes to the master branch, as this branch will contain the newest changes in ROOT we will later pull in to our feature branch. Before implementing your changes, create a new branch that we will work on in isolation from master. In this case, we will name it histogram-race-condition-fix, but you may name it differently according to what your contribution will be. git commit -m "Avoid race condition on Ubuntu 16.04"
Your changes are now in your forked repository on GitHub. We will now make the pull request. You can now hit the green "Compare & pull request" button which lets you create the pull request. Fill in a reasonable description of what your new feature is, and hit "Create pull request". A project member will later initiate a build of your pull request and then review your pull request before giving feedback and in the end hopefully merge it. More about how what happens after submitting the pull request can be found in the contributing readme. Often, there might have been changes in the upstream/master repository that you want to have together with your new changes. This section will describe how to pull the new changes. The entire workflow is summarized in the image above. First, we cloned root-project/root, and cloned it to our local machine. Then after making the commit, we pushed the change to origin. Optionally, we can pull down the last changes from upstream and rebase our branch onto the current master and force-push this to origin. After this, we create a pull request on GitHub from origin. 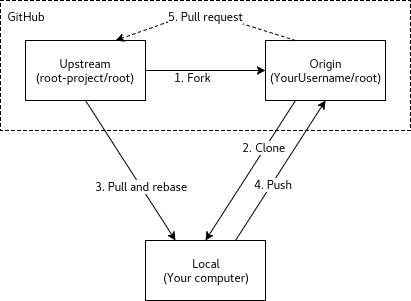 It is important to note that it is not necessary to fork and clone for each contribution. to continue the rebasing process. After all conflicts have been resolved, you can check that your changes are really what you want with git log -p master..<your branch> then push the result (without using --force).